На фото астероида не видно кратеров, одни выщерблены. Похоже, что он очень молодой и плотный. МОСКВА, 23 сен — РИА Новости. Японское агентство аэрокосмический исследований (JAXA) опубликовало фотографии с поверхности астероида Рюгу. Фотографии были получены после того, как два японских ровера, запущенных с зонда "Хаябуса-2", совершили первую в истории успешную посадку на поверхность астероида и смогли отправить фотографии. Фотография, сделанная зондом Rover-1B почти сразу после отделения от автоматической межпланетной станции "Хаябуса-2"
The miniature rovers, each smaller than the diameter of a typical dinner plate, were released from the Hayabusa 2 spacecraft Friday as the spacecraft descended within 200 feet (as close as 55 meters) from Ryugu. 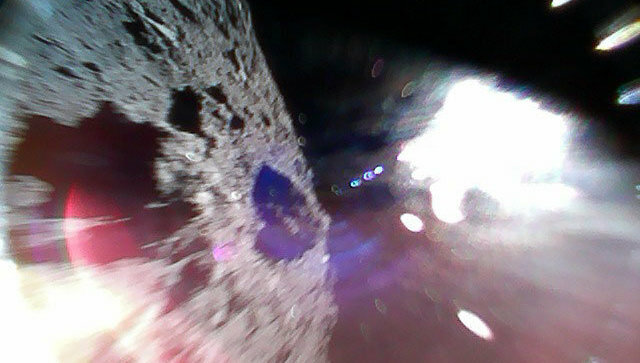 Carried aboard the Hayabusa 2 spacecraft since its launch from Earth in December 2014, the disk-shaped MINERVA-II robots floated down to the asteroid, tugged by Ryugu’s tenuous gravity — 80,000 times weaker than Earth’s — until they reached the surface at a speed predicted to be less than 1 mph (about 30 centimeters per second). 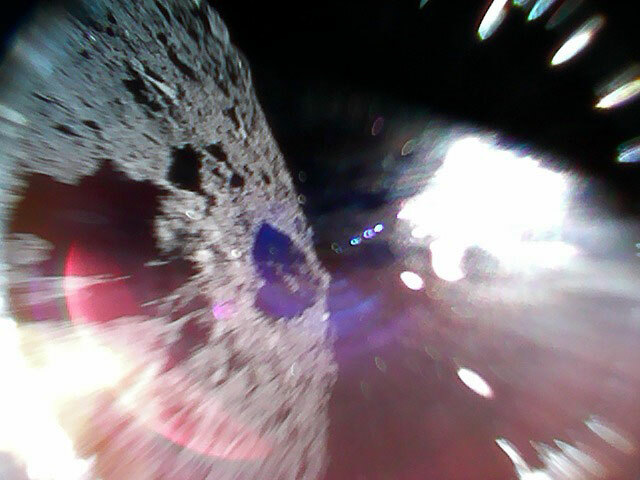 The robots returned imagery and science data to controllers on Earth via the Hayabusa 2 mothership, showing smeared views of Ryugu’s boulder-strewn surface and the Hayabusa 2 spacecraft itself as the landers tumbled toward the asteroid. 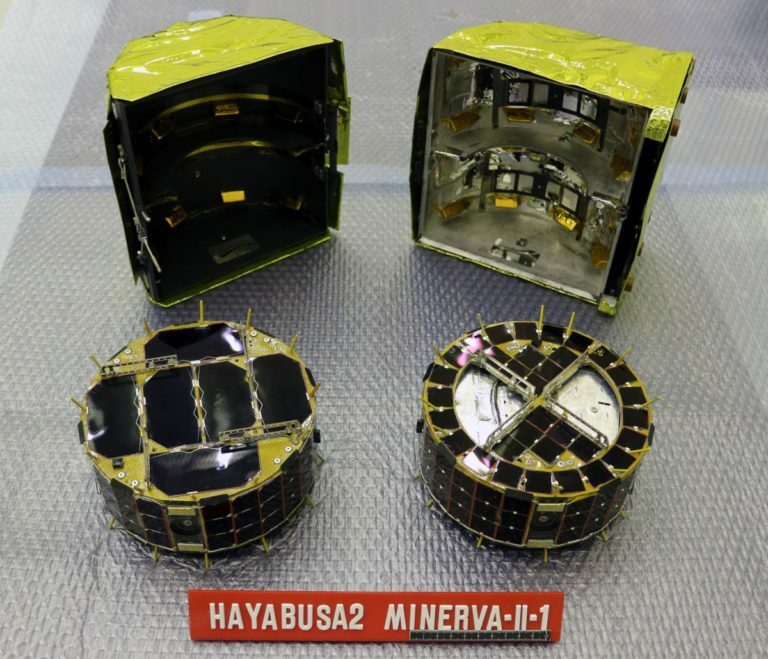 Officials from the Japan Aerospace Exploration Agency confirmed Friday that the MINERVA-II robots separated from Hayabusa 2 as planned. 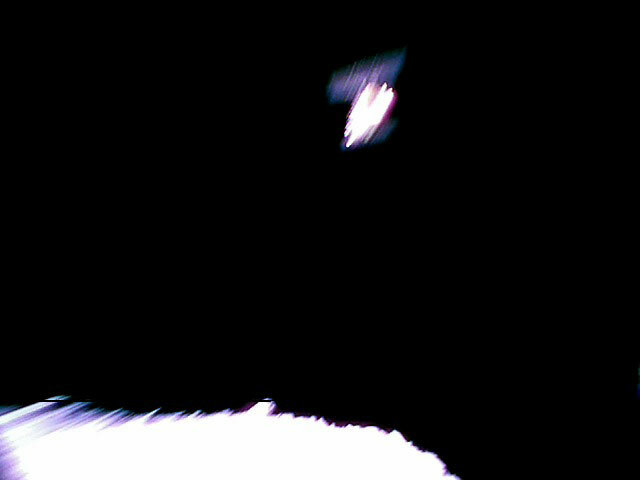 The Hayabusa 2 team provided play-by-play updates on Hayabusa 2’s descent toward Ryugu from a “home position” around 12 miles (20 kilometers) from the asteroid, tweeting images from the craft’s navigation camera as it maneuvered closer to the asteroid. In a press conference Friday following the deployment of the MINERVA-II rovers, Japanese scientists said they received data from the landers as they headed toward the asteroid. JAXA released the first images from both rovers Saturday, and confirmed at least one of the nano-probes — Rover-1A — was moving across the asteroid surface, using an internal mechanism to hop to different locations on Ryugu. No previous mission has hopped to different locations on an asteroid, or returned images from an asteroid’s surface. 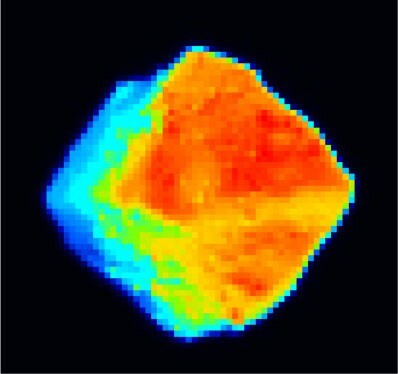 So far, none of the images released by JAXA were captured on Ryugu, but the robots are covered in solar cells, allowing their batteries to be recharged for continued operations. Japanese scientists celebrated the feat, which came 13 years after Japan’s predecessor Hayabusa mission deployed a similar lander at asteroid Itokawa. But the first MINERVA rover missed Itokawa and floated off into space. MINERVA stands for MIcro Nano Experimental Robot Vehicle for Asteroid, and Hayabusa 2 carried three second-generation MINERVA-II rovers. The third lander will be released for another descent to Ryugu some time next year. Another lander, slightly bigger than the MINERVA-II rovers, is set for a descent to asteroid Ryugu on Oct. 3. The Mobile Asteroid Surface Scout, or MASCOT, lander was jointly developed by the German and French space agencies and measures about the size of a shoebox. Like the Japanese-built MINERVA-II rovers, MASCOT will attempt to hop to different locations on Ryugu, taking pictures and collecting scientific measurements about the asteroid’s environment and composition. The MINERVA-II robots each weigh a little more than 2.4 pounds (1.1 kilograms), and carry cameras, thermometers and other sensors to investigate Ryugu from the surface. The MINERVA-II landers each have a diameter of 6.7 inches (17 centimeters) and stand around 2.7 inches (7 centimeters) tall. The Hayabusa 2 mothership was responsible for placing the landers on a trajectory toward Ryugu’s northern hemisphere. NASA’s NEAR-Shoemaker mission was the first spacecraft to achieve a soft landing on asteroid, when it made a controlled touchdown on Eros in 2001 and unexpectedly continued beaming science data back to Earth. But NEAR-Shoemaker did not return any asteroid images from the surface of Eros, leaving that “first” in space exploration still up for grabs. 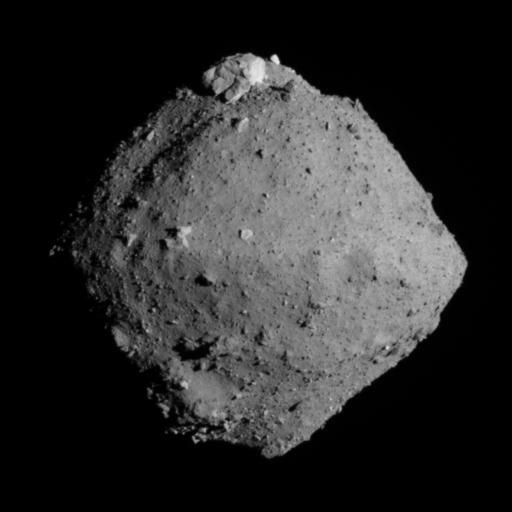 Hayabusa 2 arrived at Ryugu in late June, kicking off more than a year of mapping, scientific surveys and a series of descents toward the asteroid to drop off landers and pick up rock samples for return to Earth. The mission’s early reconnaissance of Ryugu allowed scientists to measure its size and mass. The asteroid has a slightly flattened shape, spanning around 3,280 feet (1 kilometer) in diameter along its equator and approximately 2,880 feet (880 meters) from pole-to-pole. Ryugu makes one rotation every 7.63 hours and has a mass of roughly 450 million metric tons (496 million tons), yielding a calculation of the asteroid’s gravity. 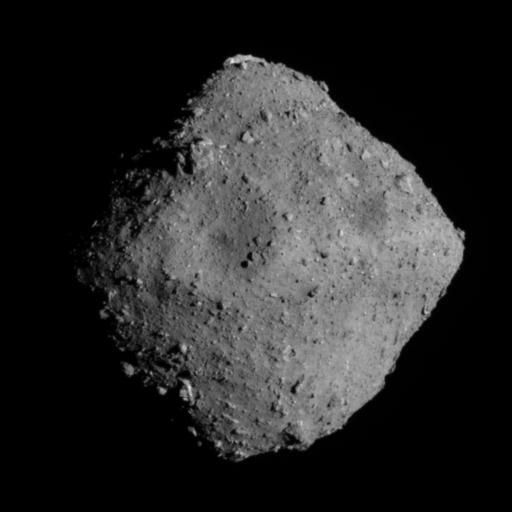 Scientists say Ryugu is a C-type asteroid, suggesting it contains primitive building blocks left over the formation of the solar system 4.5 billion years ago. Managed by the Japan Aerospace Exploration Agency, Hayabusa 2 will bring back specimens of the asteroid’s primordial surface for analysis in sophisticated laboratories on Earth. The spacecraft is scheduled to attempt to collect the first of three samples from Ryugu as soon as late October, using a pellet fired into the asteroid to force surface material through a funnel into a collection chamber. Hayabusa 2 rehearsed its descent maneuvers for the first time earlier this month, but aborted the approach after its laser navigation sensor was unable to provide range and closure rate information to the probe’s computer. 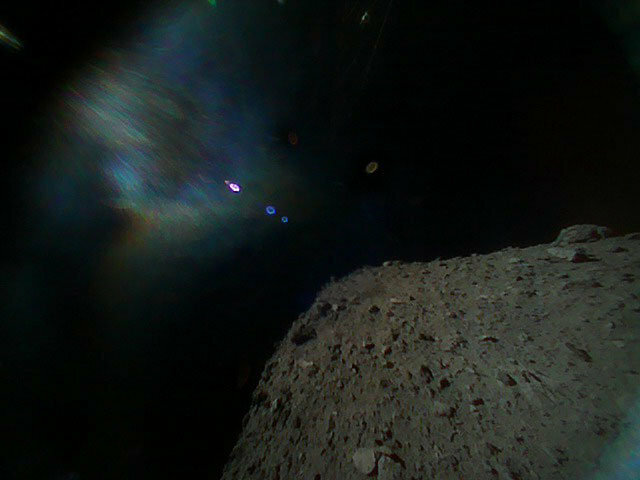 Engineers blamed the miscue on Ryugu’s dark, unreflective surface, and adjusted settings on the laser navigation sensor to prevent the problem from recurring in the future. No such issues were reported Thursday or Friday as Hayabusa 2 deployed the MINERVA-II landers. Once it has specimens from Ryugu, Hayabusa 2 will fire its ion engines and depart Ryugu late next year, heading for a landing in Australia in December 2020. Диаметр кратера - вала грунта, выброшенного ударом и осевшего на поверхность , - существенным образом зависит от силы тяготения тела. Очевидно, в данном случае диаметр возможных кратеров больше размера Рюгу. Да есть там кратеры! При том один - огроменный, непонятно, как он образовался - при таком ударе вдребезги Рюгу развалился бы. Хотя... можео он с тех времен, когда астероид был здоровенным, а потом уже развалился, унаследовав старый кратер. This week was very exciting. On September 19, preparation began for the separation of the MINERVA-II1 rovers. Descent from the home position began at around 14:00 JST on September 20. On September 21 after 13:00 JST, the two MINERVA-II1 rovers, Rover-1A and Rover-1B separated from the spacecraft. After this, the spacecraft rose and returned to the home position at around 15:00 JST on September 22. After separation, we attempted communication with MINERVA-II1. By September 22, images and data confirmed that both rovers had landed on Ryugu and that at least one was hopping and moving. We published a press release on September 22, releasing the situation of MINERVA-II1 and the acquired images. The Project Members were also very impressed by these images sent from MINERVA-II1. The BOX-B operation ran between August 18 and September 7. Here, we explore the images taken fr om BOX-B. Hayabusa2 usually stays at the home position, about 20 km fr om Ryugu. The direction of the spacecraft is also fixed as the home position for Hayabusa2 is situated on the line connecting Ryugu and the Earth. During this exploration period, the Earth and Sun could be seen in almost the same direction from view point of Ryugu. That meant that if the spacecraft were to stay at the home position, Ryugu would appear similar to an almost full moon. This is convenient as almost all of Ryugu is illuminated, but it is important to observe the asteroid not only from the front but also from diagonal directions. To achieve these different viewing angles, we initiated the BOX-B operation. A schematic of the BOX-B operation is shown in Figure 1. The spacecraft started from the home position on August 18, initially moving north of the ecliptic plane to reach 9 km on August 24. Hayabusa2 remained at this new location for about one day. From there, it was easier to observe the south pole side of Ryugu (the asteroid rotates in the opposite direction to the Earth, so the Earth’s north pole is Ryugu’s south pole). Hayabusa2 then moved diagonally, moving to a position on August 31 wh ere the evening side of Ryugu was easy to see. After spending one day in this location, the spacecraft returned to the original home position on September 7. This was the BOX-B operation. As the observations were gathering during this travel, we sometimes also refer to this as the “observation tour”. Here we take a look at the images taken during the BOX-B operation. First is Figure 2, which shows an image of the south pole side of Ryugu. There is a large boulder near the south pole, and if we include the smaller rock masses as well, we can see that the vicinity of the south pole is also covered with boulders. 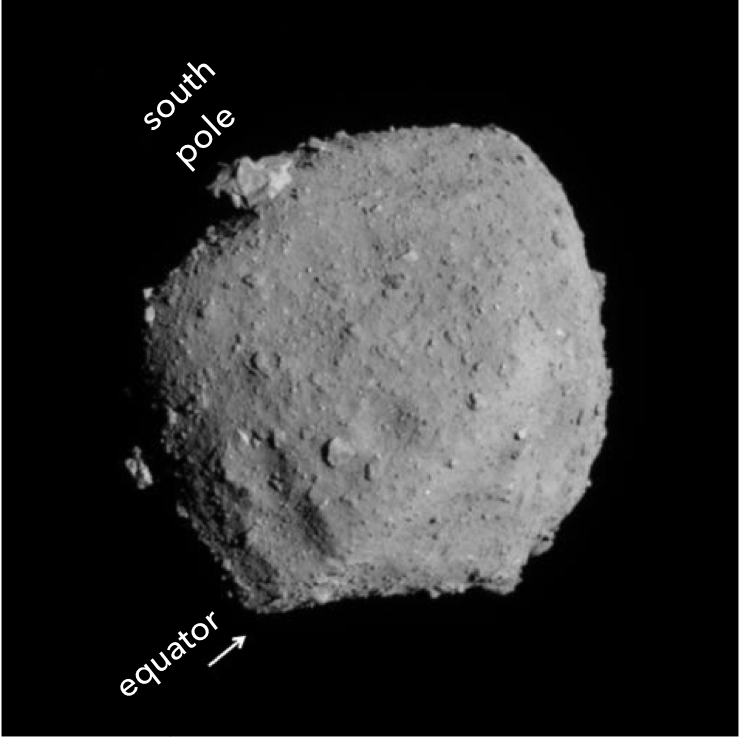 Figure 2: Image of Ryugu towards the asteroid’s south pole. Photograph taken with the Optical Navigation Camera Telescopic (ONC-T) on August 24, 2018 at around 17:00 JST. The image was captured from a position of around +y = 9 km. The distance to Ryugu was about 22 km. These next images show the evening side of Ryugu. Figures 3 and 4 show the images captured by the Optical Navigation Camera Telescopic (ONC-T) side-by-side the image taken with the Thermal Infrared Imager (TIR). Figure 3: Images taken in the evening direction of Ryugu. Left is the photograph with the Optical Navigation Camera Telescopic (ONC-T) and on the right is the photograph from the Thermal Infrared Imager (TIR). The photographs were taken on August 31, 2018 at around 19:00 JST from a position of around -x = 9km. Figure 4: Images taken in the evening direction of Ryugu. Left is the photograph with the Optical Navigation Camera Telescopic (ONC-T) and on the right is the photograph from the Thermal Infrared Imager (TIR). The photographs were taken on August 31, 2018 at around 23:00 JST from a position of around -x = 9km. On the left-hand side of the ONC-T image, you can clearly see the shadows from the asteroid’s bumpy surface wh ere the Sun is setting. Comparing the far-left side with the TIR infrared image, you can also see that the ONC-T frame includes a region on the nightside of Ryugu from which no light was reflected. 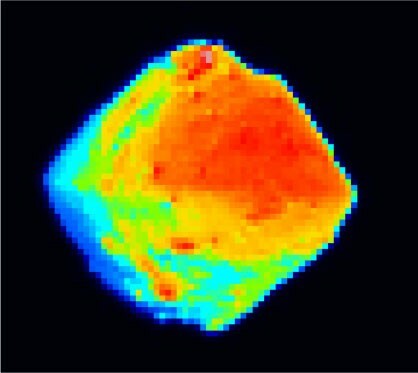 The TIR image indicates high temperature regions in red and low temperature regions in blue, from which it can be easily seen that the temperature drops on the night side of Ryugu. Evening observations like this one allow us to understand the appearance of the irregular surface features as well as the changes in temperature the asteroid experiences. 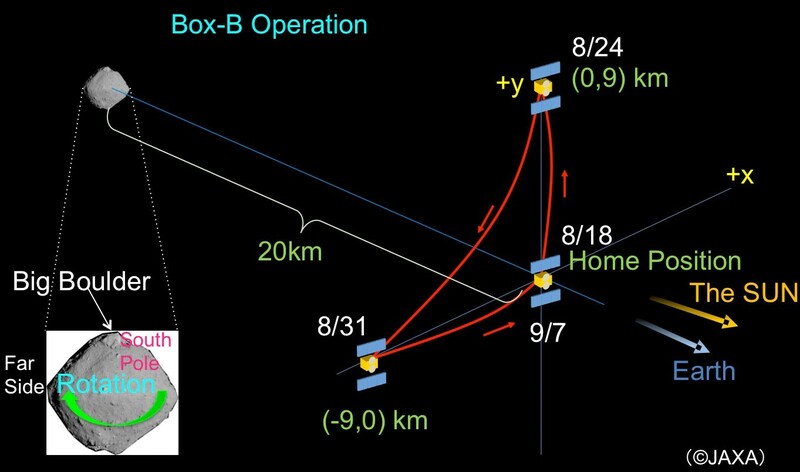 In this BOX-B operation, we observed the south side and evening side of Ryugu. The reason for observing the south side was to investigate the large boulder in detail. The evening side was observed as it was an easy to reach during this operation of the spacecraft. Additionally, as the region observed covered noon through to night, it was a good opportunity to investigate the drop in temperature. The next BOX-B operation is not currently scheduled, but a good candidate for the future observation tour would be the north pole side and the dawn side of Ryugu. Reference: For details on the BOX, please refer to this article. ※ Please use the displayed credit when reproducing these images. In the case wh ere an abbreviated form is necessary, please write ※１ "JAXA, University of Tokyo & collaborators" and ※2 “JAXA, Ashikaga University & collaborators”.